AMC and Next Games recently announced that they will be releasing a new augmented-reality game, “The Walking Dead: Our World,” on July 12. The app follows a similar location-based format as Niantic’s “Pokemon Go,” which was released in 2016 and soon took over smartphones. Players will be able to create their own avatars, team up with other players to rescue survivors, and embark on weekly challenges. Characters from the show, including Rick, Daryl, and Michonne will also make an appearance. The game will be available on the iOS App Store and Google Play. Netflix's Marvel series and The CW's DC series get all the attention, but not every comic book adaptation on TV is a super-powered part of a multi-show universe. The "Dark Matter" TV series came years after the debut of the Dark Horse comic book that it's based on, but creators Joseph Mallozzi and Paul Mullie originally conceived of the series -- about six individuals who wake up on a starship together with their memories wiped -- as a TV show before it was redeveloped as a comic in 2012. Syfy has a number of science fiction series based on lesser known comic book titles, including the fan-favorite "Wynonna Earp," starring Melanie Scrofano as the demon-fighting descendent of legendary lawman Wyatt Earp. After the massive success of AMC's "The Walking Dead," creator Robert Kirkman went on to adapt his supernatural horror comic series "Outcast" for television. The adaptation, starring Patrick Fugit as the titular outcast, debuted on Cinemax in 2016. The CW's "Arrowverse" gets all the attention for being the network's hugely successful adaptation of several iconic DC Comics series, but the network also has the crime dramedy "iZombie" from "Veronica Mars" creator Rob Thomas on its slate. The show is a very loose adaptation of the comic book series of the same name from DC's Vertigo imprint. Lead character Lucifer Morningstar, the "Lord of Hell" who abdicates his throne to move to Los Angeles, was created by Neil Gaiman for the Vertigo series "The Sandman" in 1980. 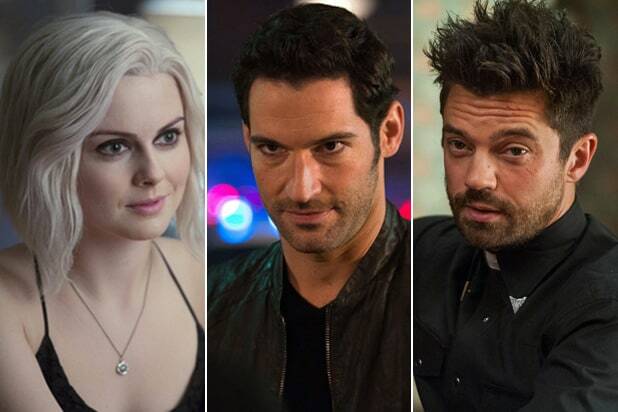 The character landed his own TV show in 2016 when Fox debuted "Lucifer," starring Tom Ellis. Given the runaway success of "The Walking Dead," it was natural that AMC would turn to a different comic book adaptation as its follow-up. Starring Dominic Cooper as a Texas preacher, 2016's "Preacher," based on the Vertigo comic book series, was developed by Sam Catlin, Evan Goldberg and Seth Rogen. The DC Comics character Christopher Chance has been twice adapted for television, once in 1992 on ABC and then in 2010 on Fox, with Mark Valley playing the assassin-turned-security consultant. Both iterations were fairly short-lived, with ABC's version lasting seven episodes and Fox's take faring slightly better, at two seasons. HBO's famous horror anthology series "Tales From the Crypt" was actually a loose adaptation of several EC Comics horror franchises. Many of the show's tales were adapted from EC's three horror magazines, "Tales from the Crypt," "The Vault of Horror" and "The Haunt of Fear." Javier Grillo-Marxuach's Viper Comics series "The Middleman," about a secret agency that fights evil, was originally intended to be a TV series, but was later developed as a comic. In 2008, Grillo-Marxuach's original vision was realized when "The Middleman" ran for 13 episodes as an ABC Family series. Following "The X-Files," Chris Carter adapted the comic book "Harsh Realm" by James D. Hudnall and Andrew Paquette for an extremely short-lived Fox series. The show, about a group of humans trapped in a virtual reality simulation, ran for just three episodes before it was yanked from the schedule and banished to sister network FX. Long before Archie himself would hit the small screen on "Riverdale," the Archie Comics series "Sabrina the Teenage Witch" was adapted into a hit ABC sitcom starring Melissa Joan Hart. The legacy of that long-running show has led to much speculation about whether or not the character might one day show up on the new CW adaptation of her sister comic.